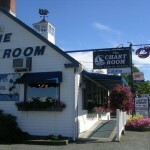 The Chart Room is located on Route 3, not far from Acadia National Park. It is situated right on the water with an outside deck, giving diners a spectacular view of the harbor while they dine. Reservations are suggested, it’s known to get a little crowded. The owner suggested the Black Angus Prime Rib, which she mentioned was slow cooked for about 8 hours.